While winter has finally begun to show its vulnerability and fade into a more gentle spring, we are still assaulted with the occasional snow storm here in Maryland. When this happens, our helpful private and government snowplow drivers take to our driveways, streets, and freeways to make travel safer for all of us. Unfortunately, the sheer size of the vehicles they operate and their frequent use in hazardous conditions often lead to motor vehicle accidents, many of which can cause significant injury or even death. On average, snowplow trucks carry roughly 15 times the weight of a standard passenger vehicle, making them more difficult to maneuver. Their size also makes it far more difficult for them to enact evasive maneuvers safely if another car within their proximity is spinning out of control or is unable to stop. These massive trucks are being driven in the worst weather of the season and are far more complicated than average cars or trucks—factors which can overwhelm an inexperienced plow driver and make snowplows far more dangerous than an average vehicle on the road. Accidents involving snowplows happen far too often and can affect motorists and pedestrians alike. Sadly, Maryland has already seen one snowplow-related fatality this year—a plow struck and killed a pedestrian shortly after midnight on the morning of January 21st in Beltsville. 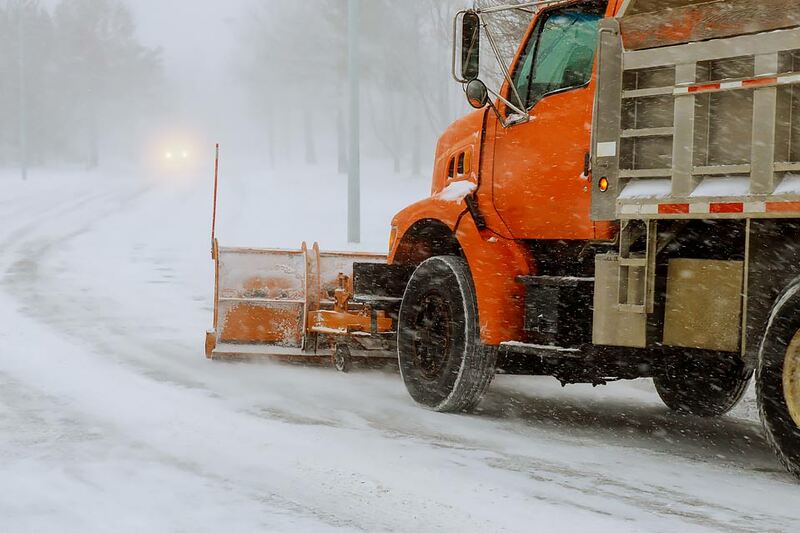 Snowplow drivers face danger on the job from other vehicles too: just last month, a Maryland State Highway Administration driver suffered life-threatening injuries after being struck by a car while standing next to his plow. Details of these cases are still pending, but visibility often plays a significant factor in these types of accidents, so it’s important that all pedestrians and drivers remain aware of their surroundings and keep a safe distance from snowplows. With that in mind, here are a few helpful tips to keep in mind to avoid a potentially serious accident with a snowplow truck. Safe Distances: Because the path in front of a plow is far more hazardous than the path they are creating behind them, these vehicles often travel at low speeds, especially on the freeway. Additionally, visibility is often decreased in inclement weather—giving drivers another reason to travel slowly, as they might need to brake or change lanes to avoid other motorists. Keep a safe distance behind a plow truck to avoid having to stop abruptly, and only pass when it is safe to do so. Pass with Caution: If you must pass a snowplow, make your initial lane change well behind the plow so that the driver has plenty of time to take note of your vehicle in their side mirrors. Also, make sure that you are traveling a good distance in front of them before switching back to your preferred lane. Give Them Space: When traveling on an undivided section of road, safely maneuver your vehicle as far away from the center line as possible without compromising your own safety. Snow plows are often oversized and their large blades could cross the center line. Scrape and Brush Thoroughly: Many motorists forget to scrape their headlights and taillights before operating their vehicle, which can obscure your lighting structures and make your vehicle more difficult to spot. Be sure to thoroughly scrape and brush the entire exterior of your car, truck, or van before traveling in snowy weather. If You Become Stranded: In the event that you become stranded, pull over as far as you can on the shoulder of the road or off-ramp. Remain in your vehicle and call 911 immediately. Follow the operator’s instructions to the letter and remain on the line until a plan of action has been established. If you must keep your engine running while stopped, you should wait until the road is clear and then examine your exhaust pipe to be sure that it is not obstructed by snow, ice, or debris. A blocked exhaust pipe can cause dangerous carbon monoxide gas to back up into your vehicle’s cabin. If you are involved in an accident with a snowplow, it’s imperative that you remain calm and take measures to ensure your safety. Move your car to the side of the road or off-ramp if you can and check to see if anyone else has been injured. If anyone at the scene needs assistance, call 911 immediately. Even if the damage from the crash appears to be minor and no one is hurt, it’s usually best to call the police to report an accident. As you would with any other motor vehicle accident, exchange your contact and insurance information with other drivers and witnesses, and take photos of the scene if the situation permits. If property damage has occurred, locate the owner to inform them. Request a copy of the police report from the officer at the scene or ask where you can get one if a copy is not immediately available—this can be very helpful for insurance purposes, or if you decide to file a personal injury claim related to the accident. If you or a loved one has been involved in a snowplow accident or any other form of motor vehicle accident, please get in touch with the team at Pinder Plotkin. Our attorneys have the experience and knowledge you need to achieve proper financial restitution for your injuries and property damage. For personal injury claims, our contingent fee policy ensures that you do not pay a dime in fees or expenses until your case has been satisfactorily resolved. Please call us today at (410) 661-9440 or visit our website to receive a free consultation regarding your case.